Perfect for personalising, or to enjoy just as they are! Great for those beginning, or finishing their careers, or for wedding celebrations or a new baby. What better way to mark the moment than to add that very special ceramic to the collection! Based on a classic 18th Century Georgian shop located in Bath, the Accountant and the Attorney at law will fit in with any high street collection, These can also be personalised – we can paint the name of the company or the individual on the fascia, and we can find a little bit of room for one or two other small details, important dates, for instance. The Accountant and the Attorney at Law measure 22cm (8 & 3/4″) tall x 10.2 cm (4″) wide. This building is located in Old Portsmouth, Hampshire, and looks every inch the home of the family doctor or dentist we would trust! For those of you with a medic in the family, or among your circle of friends, this building is perfect to for personalising with their name! There is room on the back, so we can add an inscription in gold too. On the oval plaque above the doctor’s door, we have the rod of Asclepius, a staff with a snake twisted around it, which is the symbol of Asclepius, the son of Apollo, who was a practitioner of medicine. On the dental surgery, we have an extracted molar – surprisingly without decay! The Doctor & The Dentist measure 24cm (9 & 1/2″) tall to the top of the chimney x 9cm (3 & 1/2″) wide. 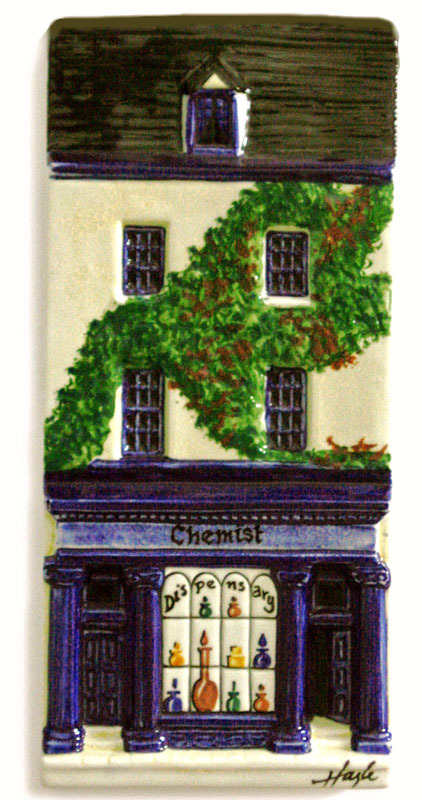 This classic 18th Century Georgian shop front is based on one in Bath, and shown here as a choice of either Chemist or Pharmacy, with it’s display of bottles and classic carboys in the window, and a trailing ivy making it’s way across the front of the building. The Chemist is one of our oldest production models, and still a favourite today – after all who could imagine a high street without it’s chemist! These ceramics make an ideal presentation piece, and be easily personalised with a name or a company name on the fascia. 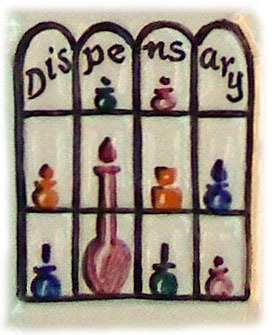 The Chemist and the Pharmacy measure 22cm tall (8 & 5/8″) x 10cm (4″) wide. To order the Pharmacy please email us. The clock tower, Located at a roundabout at the end of Torwood Street, Torquay, Devon, is a memorial to Richard Mallock whose family owned Cockington Court from 1902. Richard Mallock was an MP from 1886 to 1895. Our ceramic is perfect to display alone, or as part of a ‘Nation of Shopkeepers’ High Street. It can also be personalised,by adding a pair of names and a date, and is a popular gift to celebrate a wedding or a special anniversary. 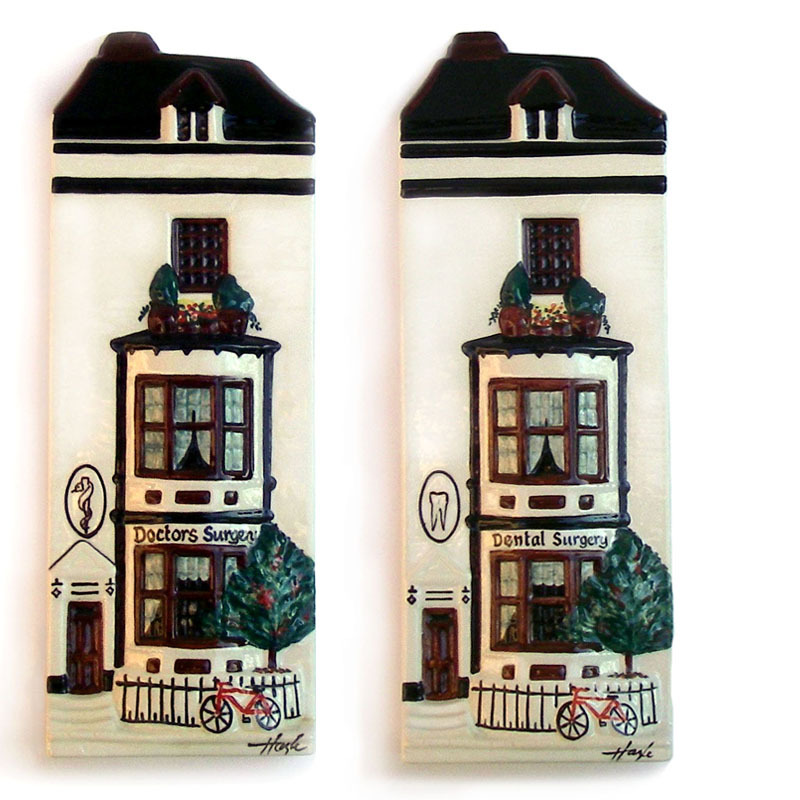 The Clock Tower measures 23.6cm (9 & 1/4″) tall x 10cm (3 &3/4″) wide at the widest point. Our Ceramics are individuals! hand made and hand painted with care, individual artisits work can vary, and a photo of one ceramic will not depict exactly every ceramic painted. They are hand made and individually finished. This means the measurements can very slightly from one to another, but only by a milimetre or two.